As author Carrie Callaghan recounted last year in this space, she stumbled upon Judith Leyster’s self-portrait at the National Gallery of Art in Washington, D.C., and, “I stopped and stared.” The portrait is an arresting image of the first woman to earn a place among the masters in Haarlem’s artists’ guild in what is now the Netherlands. Judith Leyster’s legacy was forgotten soon after her death in 1660—her paintings ascribed to other artists—until she was rediscovered again in the late 19th century. Leyster’s is a story that simply begs to be told, and Callaghan comes through for her readers in this luminous debut. In the United Provinces of the early 1600s, the merchant class had begun to amass a bit of disposable income and thus had the ability to purchase works of art to adorn their houses. As the book opens, Judith is struggling to gain her independence and establish her own workshop — demonstrating a willingness to work around restrictive guild rules in order to position herself — under a palpable sense that time is running short. The field of artists in the town of Haarlem has become crowded in response to the demand for paintings, and Judith is not the only artist concerned that the market is close to saturation. While the story deals with Judith’s obstacles as a woman in the fully male-dominated art world, that is not its focus, and in fact Judith quickly discovers that being accepted as a master is almost the least of her challenges. In order to succeed as an artist, she has to set up a workshop, convince apprentices to work for a woman, and compete for sales and commissions as a relative unknown against the established masters. As she is working through these challenges, she stumbles into a bit of intrigue. A shady character commissions her to paint a portrait of a beloved local character who later ends up dead. At the same time, linseed oil, which is crucial in creating the paints that artists use, is mysteriously growing scarce, driving prices to astronomical levels. Judith remains single-minded in her drive to become established, but that focus plays havoc with her personal relationships, driving a wedge between herself and her troubled younger brother, Abraham, and her fellow painter and friend, Maria. Judith considers that her friends “confused her fixedness of purpose with selfishness”, but eventually she needs to consider the point at which she has crossed that line. But indeed Judith did eventually marry a fellow artist, taking on more of the management and less of the creative side of the business. 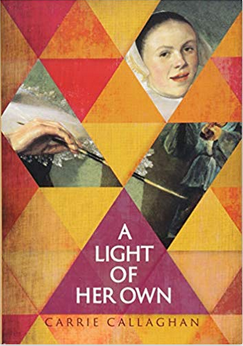 Judith Leyster’s name and talent may have been forgotten for more than two centuries, but author Carrie Callaghan has done a brilliant job in shining a light of her own onto this intriguing artist.